Stacking the Shelves is a weekly feature brought to you by Tynga’s Reviews. While I don’t plan on doing these every week, with the holidays comes gift cards, and when you are a bookworm, that means you get a lot of gift cards to Barnes & Noble or Amazon. Not that I’m complaining, mind you. This weekend I added Redshirts by John Scalzi and The Ocean at the End of the Lane by Neil Gaiman to my TBR shelf. I follow both of these authors on Twitter and am big fans of both of them there and, while I’ve read a couple of Neil Gaiman’s books, I had never read anything by John Scalzi. Time to fix that. I’ve heard good things about both of these books and can’t wait to read them. Any new books this week? Let me know in comments! Greetings one and all! Guess who hasn’t been blogging? Me! Guess who is going to have that as a New Year’s Resolution? Yep, me again! Dusted things off, set up a new format with some nice wintery ambiance, and off we go! For starters, I hope you all had a wonderful Christmas or Hanukkah or Kwanzaa or Yule or insert-chosen-winter-holiday-here. Or hey, hope you at least got a day off work. That works too! Since I got a whole bunch of lovely new books for Christmas (and a beautiful new Kindle Fire HD for my birthday, which happens to be today 🙂 ), I decided to do a “Stacking the Shelves” post, something I haven’t done in a while. 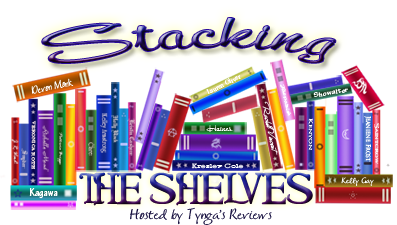 “Stacking the Shelves” is a weekly feature hosted by Tynga’s Reviews. The rules are simple – all you have to do is gush over your latest book finds, whether hardcover, paperback, ebook, graphic novel, comic book, library book. Heck, if you got a really thick magazine that you’re excited about, that would probably work too. The Shadowhunter’s Codex by Cassandra Clare and Joshua Lewis – a must for any Mortal Instruments/Infernal Devices fans. The Bane Chronicles by Cassandra Clare, Sarah Rees Brennan & Maureen Johnson – Originally done as a series of short novella ebooks about one of my favorite characters, Magnus Bane, this is the hardcover collection of all of them. The Iron Trial by Cassandra Clare and Holly Black – It’s a Cassandra Clare Christmas! Not quite, but close. This is a new series that looks good. I love Holly Black as well, so looking forward to this. The Land of Stories: The Wishing Spell by Chris Colfer – I loved Chris Colfer on Glee back when I used to watch TV and this book series looks really cute. Plus my kids want to borrow it after I’m done. Hyperbole and a Half by Allie Brosh – If you haven’t read this web comic, do it. Now. It is brilliant. Funny, irreverent, heartbreaking at times. Now I have a nice shiny physical copy to keep on my bookshelf. Let It Snow by John Green, Maureen Johnson and Lauren Myracle – This is a collection of three short stories by three authors who I love. Each story is different, but they’re all connected. Should be fun! Did you get any books during this holiday season? If so, let me know in comments! It’s a sickness . . .
Another “Stacking the Shelves” post on this Monday morning, brought to you by Tynga’s Reviews. To put it simply, I’ve been a bad, bad girl. I can’t stop buying books! I’ve tried! They practically jump into my waiting arms! Between last weekend’s trip to New York City (oh the bookstores, oh my heart!) and this weekend’s trip to the local used bookstore (thank ye gods for trade credit), I’ve bought several new titles, despite the fact I still have several sitting on my bookshelf that are glaring at me. Sigh. What can you do? Arrows of the Queen by Mercedes Lackey – I haven’t read many books by Mercedes Lackey, but I have several friends who are die hard fans. I’ve been wanting to read her Valdemar books, but there are so many, I didn’t know where to start. Then this book was recommended as a book club pick over at the Mallorean Tavern. Bingo! A place to begin! Found this one at the B&S as well. Divergent by Veronica Roth – I got this one from our local used bookstore. I’ve had two big boxes of books to trade in, which gave me $79.00 worth of credit. Not too shabby! I know absolutely nothing about this book. Nothing at all, except that it’s the first book in a series and it keeps showing up on all these GoodReads lists with a lot of other books I like. So I’m giving it a try. Why not? White Cat by Holly Black – Another book that I don’t know much about, except that I know the author. I really like Holly Black’s fairy books, and I have seen quite a few reviews up on GoodReads and Twitter about this particular series. Again, I found it at the used bookstore and had the trade credit to get it for free. Can’t beat that. So there’s my book buying binge. I have no idea what to read next. I was a bad girl . . . Yes, I was. I went on a book binge this weekend. And so, I bring you another “Stacking the Shelves,” hosted by Tynga’s Reviews. Fire by Kristin Cashore – This is the second book in the Graceling series and I couldn’t pass this one up. There’s this funny little store in our town called Ollie’s (not sure if they have those elsewhere or not) and they specialize in closeouts and excess inventory stuff. They have a really nice book section, even if it has a random selection from time to time. I found Fire stuck in a shelf with totally unrelated stuff and it was only $1.99. What would you have done? Skinned by Robin Wasserman – So we went to the local used bookstore, Edward McKay, and even though I wasn’t really planning on buying much, I ended up buying a few things. I know nothing about this book, not really. The reason I bought it was because of the author. I follow another author, Maureen Johnson, on Twitter. She is a really great author and a funny person, and I happen to know that she and Robin Wasserman are friends. Because of this, I now follow Robin on Twitter, and figured I ought to actually read one of her books. Scarlet by A.C. Gaughen – Did you ever have a book end up on your to-be-read list on GoodReads and have no idea how it got there? No? That’s just me? Oh well. That’s what happened with this book. Someone must have recommended it to me and I stuck it on my GoodReads list so I wouldn’t forget about it. Of course, I’ve forgotten who recommended it, but I guess that’s not important. This looks to be a retelling of Robin Hood, which I like, and it was at the used bookstore in hardcover for cheap. So there you have it. My book buying binge for the weekend. I guess I need to go ahead and finish the Chicagoland Vampires books so I can get to work on these, shouldn’t I.